LG has confirmed it will not manufacture any more tablet PCs to compete with the Apple iPad or the newly-announced Microsoft Surface. The Korean giant, on somewhat of a financial upswing of late has decided to cut its loses in the slate sector in order to concentrate on manufacturing Android smartphones. The company had failed to impress with its limited foray into the tablet arena with the Optimus Pad. "We've decided to put all new tablet development on the back burner for the time being in order to focus on smartphones," said spokesman Ken Hong. "LG doesn't see Surface competing with anything we're focusing on at the moment." LG is currently the fourth biggest smartphone manufacturer in the world behind Samsung, Apple and Nokia and seems content to build on that platform. Earlier this year the company decided against developing more devices for the Windows Phone platform in order to satisfy the demand for handsets baring Google's mobile operating system. However, the company remains open to returning to Microsoft-based phones, perhaps when Windows Phone Apollo launches before the end of 2012. 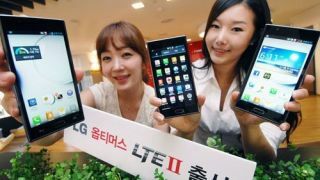 Despite exiting the tablet market, it will seemingly continue to push hybrid 'phablet' devices like the LG Optimus Vu. That handset has a 5.3-inch screen.